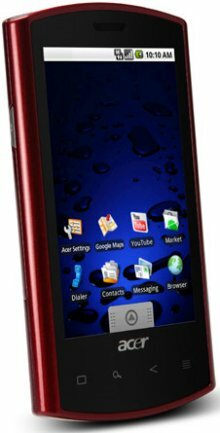 Acer introduced the Liquid e, a new Android 2.1 smartphone with a 768MHz Snapdragon processor. The phone features a 3.5" WVGA display, 7.2Mbps HSDPA, 5MP digicam, 802.11b/g WiFi, Bluetooth 2.0, GPS, an accelerometer, 3.5mm headphone jack, and microSD memory card slot. Acer Liquid e features the latest Android™ 2.1 Operating System (aka Éclair). Building on the processing and graphical capabilities of the Qualcomm™ Snapdragon™ and its high definition screen, Liquid e is the state-of-the-art for multimedia, web browsing, and social media integration. It should thrill both avid users of internet on-the-go and new users eager to experience the rich possibilities offered by this innovative device. This appealing high definition smartphone is the ideal solution for users demanding the best from their devices and in particular for high-definition video playback or streaming, gaming and browsing smoothly rich-content internet sites. • An updated version of the Android browser, supporting HTML5, double-tap zooming, video tagging support and geo-location API support. With its 3.5" high-definition capacitive touch screen, Acer Liquid e offers an unparalleled experience when watching pictures or videos, and proposes an abundance of new applications on Android™ Smart Handhelds - games, professional applications and web applets that will enrich the end user experience. Powered by the powerful Qualcomm™ Snapdragon™ processor, Acer Liquid e provides instant access to web pages, smooth streaming of videos or music, and instant response from popular mail, maps and search applications. The high-speed processing capabilities and high-speed internet access (HSPA) of Snapdragon™ brings to life the Android™ experience: no idle-time, almost instant uploads of web pages and downloads of rich multimedia content. The developer community can now take full advantage of these capabilities to bring to market innovative applications that demand raw computing power and superior handling of 3D graphics.